Genres: New Adult, Fantasy, Faeries. Dear sweet lord above! This book was just a crazy roller-coaster for my emotions. I mean crazy roller-coaster. So you can indeed expect this review to be just my crazy, jumbled thoughts all over the place too. Are you ready for the madness!! But no need to be afraid - there will be no spoilers. Even though I'm possibly sure everyone in the world has read this novel right now. You don't know how hard it was to keep away from spoilers after the first few weeks this book was released. I literally just stayed away from all social media. And thankfully I wasn't spoiled for anything! Then we got new characters into this world that just became more favourites to add to the list! The Night Court gang was just amazing. They were amazing characters and I instantly fell in love with each of them and their back stories. All so tragic, but all which made them what they are. What I really loved more about this book was the world building and the plot behind the whole novel. There was so much more in this novel. There were so many stories and back stories of characters that came out in this book that just made this world fill out more as well as developing each character with them. And I thoroughly enjoyed that. I enjoyed being able to see past and present of this world. And the plot! As I mentioned above it was one the aspects that I loved about this book and boy, oh boy, the plot in this book was delicious. 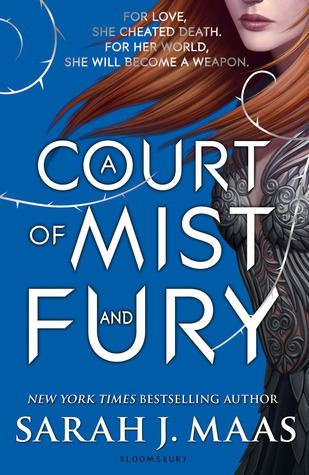 I found with ACOTAR, even though I loved it, it took me a while to actually get through the book but that was not the case with this one. When it wasn't action packed it was giving me the back stories and fleshing out the world and character and all the twists and turns that I didn't see coming. I think I was left shocked on so many occassions with this book when I didn't see what was coming. And hello emotional roller-coaster because these twists and turns had me shocked, frustrated, sad, betrayed, happy, devastated and everything in between.